Shooting in 5.2K with shockingly good, next-level stabilization abilities the GoPro Fusion is one serious camera packed into a tiny frame. But, that means nothing if you don't have an agile and daring pilot operating the quad. That's where ShaggyFPV comes in. Combine him, the GoPro Fusion, professional wakeboarders, and some slick editing - you have this epic video by rene-io. Description: Another colab with professional (DRL) drone pilot ShaggyFPV. 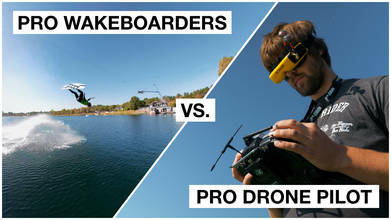 We visited Cablepark Aquabest and had a blast following these professional wakeboarders. It's one of the most frightening I personally ever done; blasting over the water chasing the wakeboarders which gave a spray with each trick they perform. Thank god for Crossfire, float packs and the Getterback recovery system, otherwise Shaggy would have one quad less 😅 ShaggyFPV: https://www.youtube.com/channel/UCEjaFzeSVd_CTJjhb4J29Ow Cablepark Aquabest: https://www.cableparkaquabest.nl/ Cameras used on race drones: Gopro Fusion - 5.2K Gopro Session 5 Gopro Hero 5 Black B-Roll camera: GH5 //12-35mm F2.8 Do you have a cool location where we could shoot our next video? Let us know! Contact via: http://www.rene.io or info@rene.io *Embedding from Youtube in it's original format is permitted. The video may not be reeditted and thereby republished in any way without written consent.